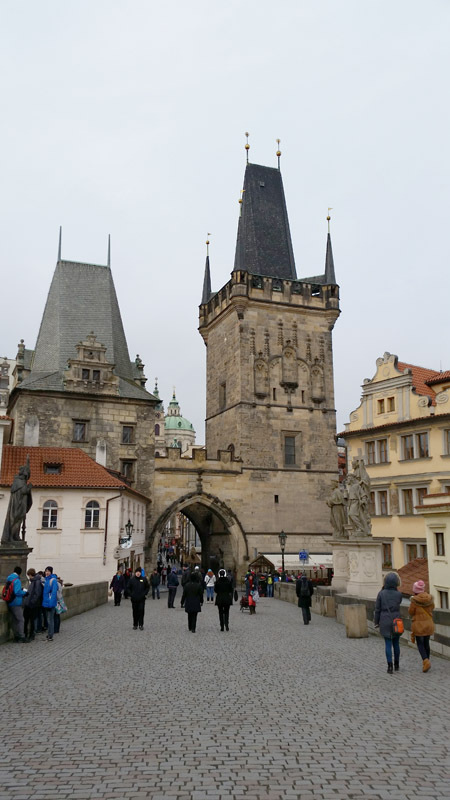 As the evening drew near I took Tram 22 back to Charles Bridge so I could visit the town square and enjoy the excitement of the people gathering, before I headed to my first concert at the Klementinum. 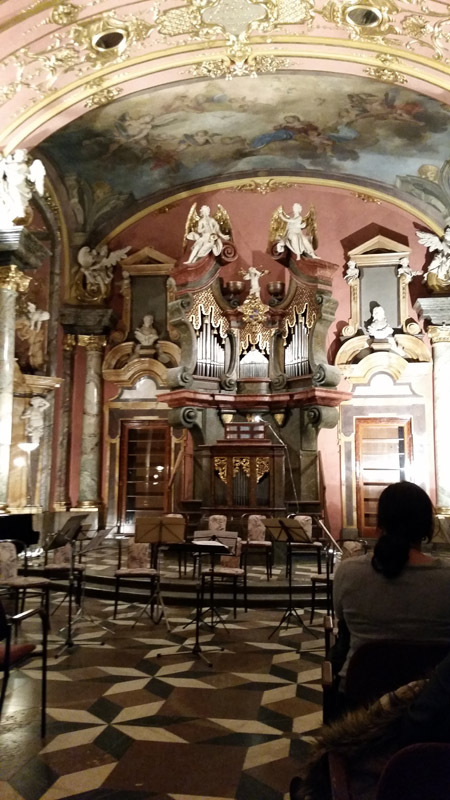 The concert was held in the Mirror Chapel which is an impressive hall from the XVIth century. The first concert was Vivaldi’s Four Seasons. 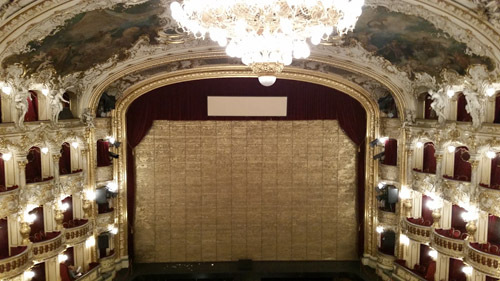 And of course B Smetana, My country Vltava. 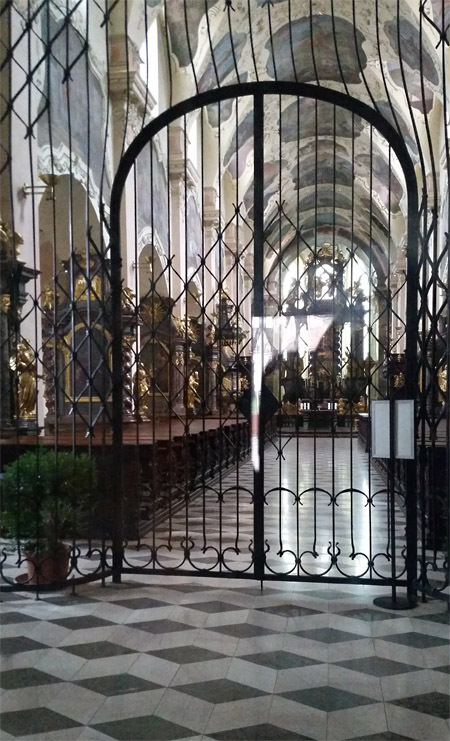 The melody that resonated in my mind where I crossed over the border from Germany to the Czech Republic was thrilling to hear performed in the Mirror Chapel. Albinoni’s Adagio and Dvorak’s Waltz in A were highlights of the concert for me. 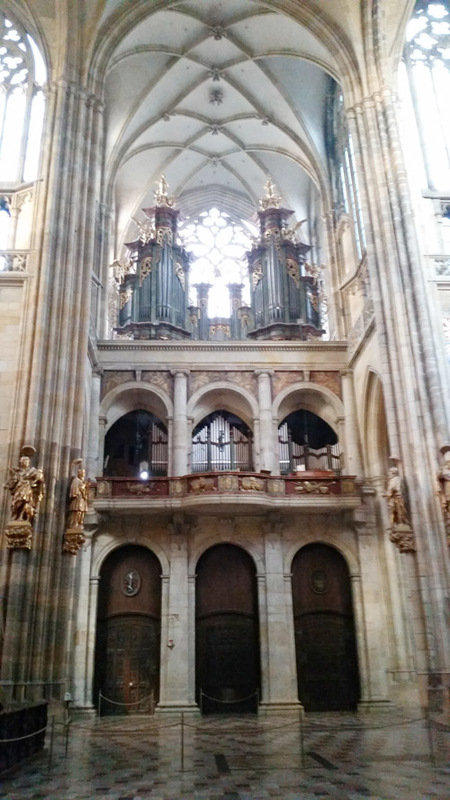 Then I remained for the second concert of Baroque organ and orchestra. 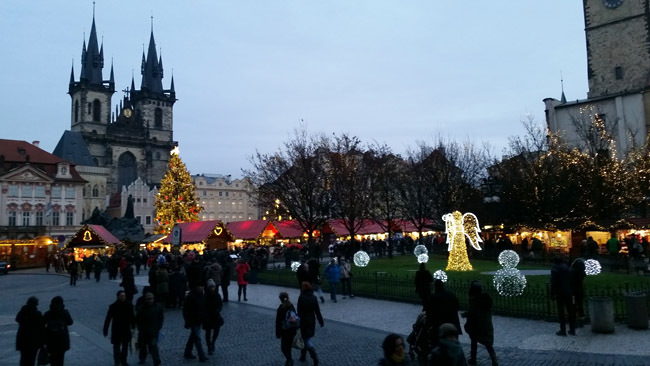 The Hall was packed for the Czech Christmas Mass by Jakub Jan Ryba. This was exhilarating in its festivity and the room was electrified. 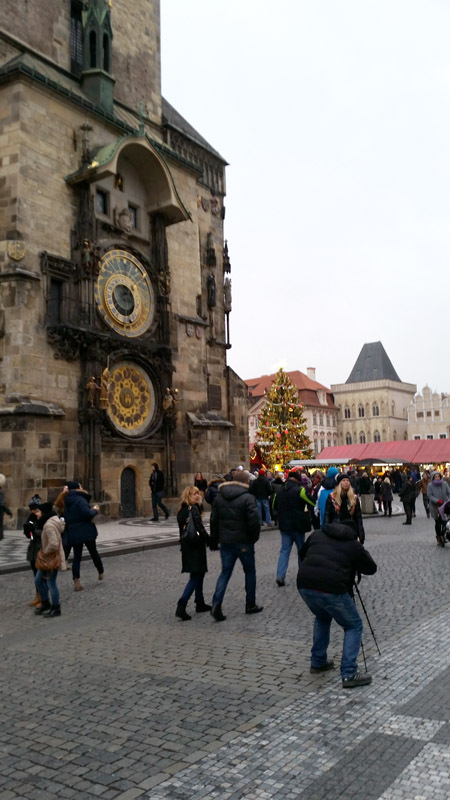 When I left there we a few snow flakes which only added to the conclusion of two days in Prague. It is truly a magical city and musical. 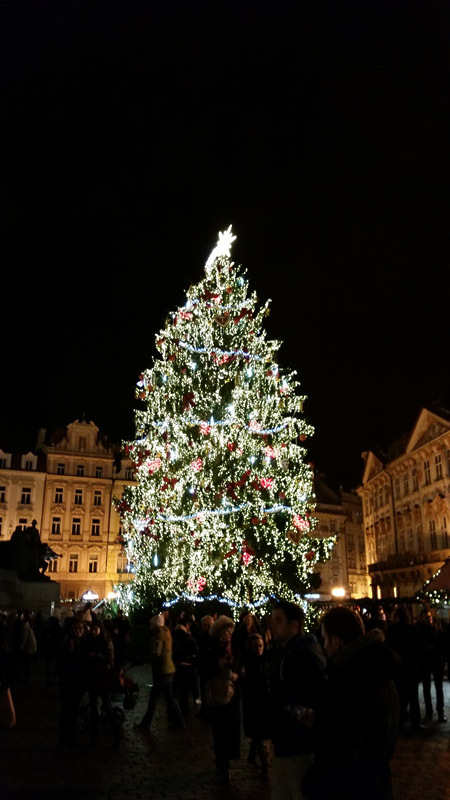 This entry was posted in Beauty, Christmas, Europe and tagged Christmas, Klementinum, Music, Prague, Smetana on December 16, 2014 by frjfkauffmann. 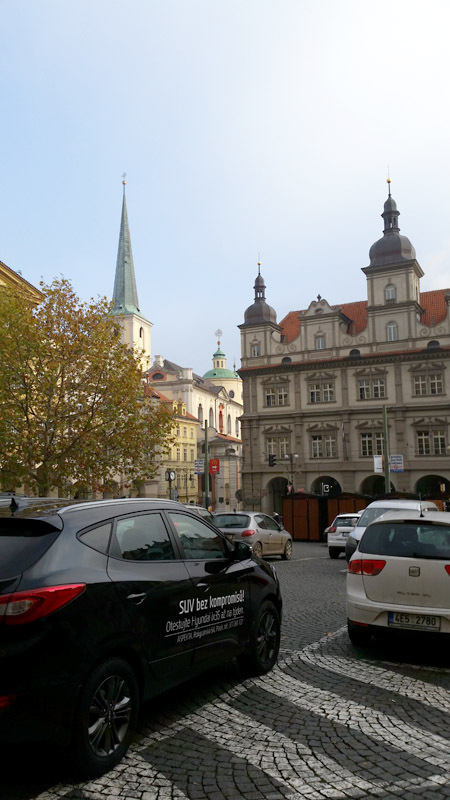 Tram 18 takes you up to the top of the hill past the Palace Complex to the Strahov Monastery that was established in 1143. 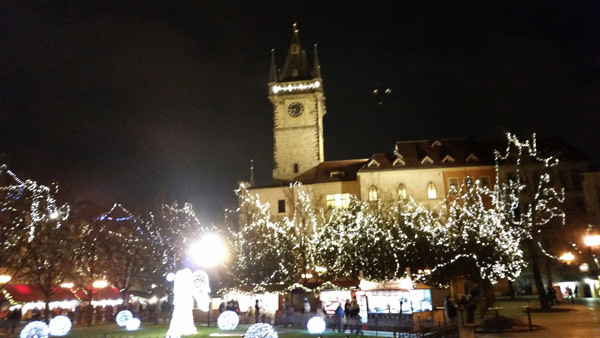 Despite the efforts of the Hussite wars and later the Communists no one was able to shut it down. 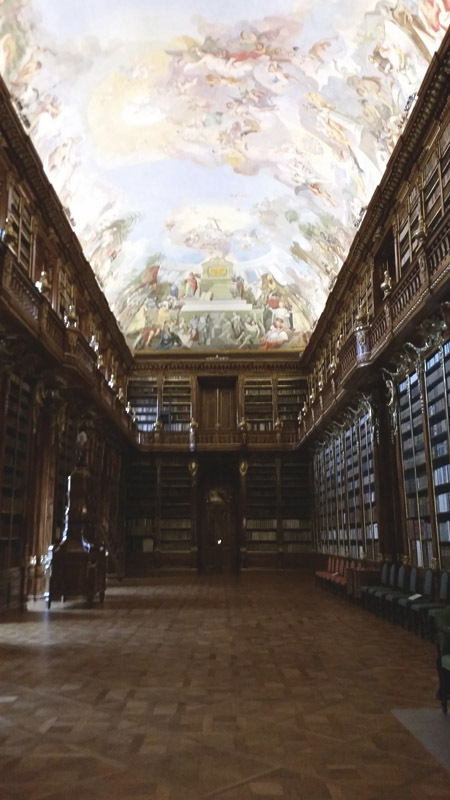 The monks at the Premonstratensian Monastery at Strahov from the earliest times have been committed to education and the library witnesses to that, and it is one of the largest in the country. As the tour brochure points out: “The diversity of the collection of art, literature, music and curiosities, all of which were intended in the past as well as the present to be a Speculum Mundi to please the eye as well as the spirit, being the key to knowledge and as understanding of the world.” Those words capture well the spirit of the monastery: Speculum Mundi, that is, a mirror on the world. Walking a little further down the hill I came to Loreto Abbey which has a remarkable Baroque facade with a clock tower whose bells are thrilling. No pictures are allowed inside. 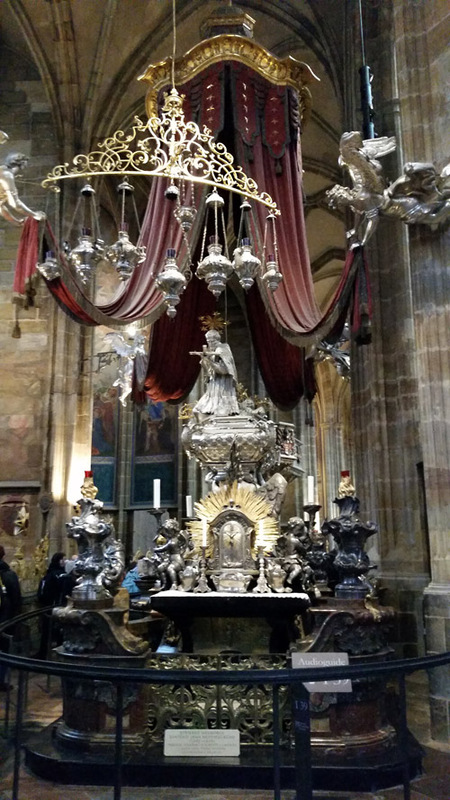 The Treasury is remarkable and there is a monstrance with 6222 diamonds. 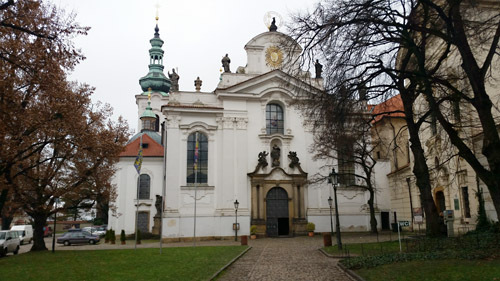 This treasury is the most valuable in the Czech Republic. 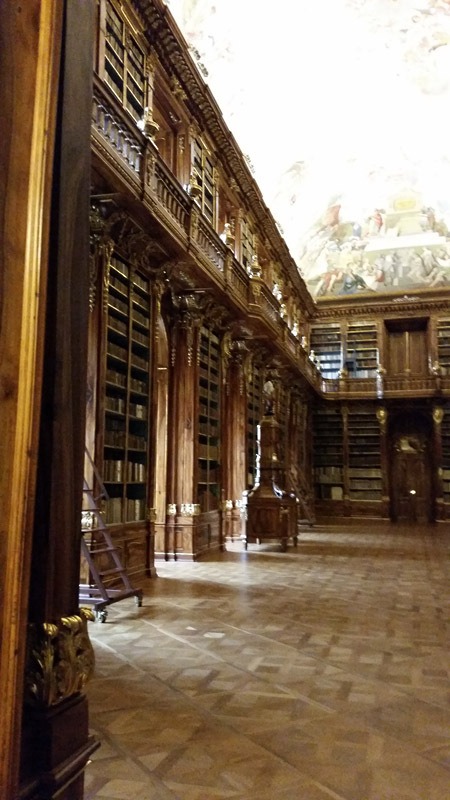 This entry was posted in Europe, Faith and tagged Library, Loreto Abbey, Prague, Premonstratensian Monastery on December 15, 2014 by frjfkauffmann. This morning I decided that I had several things I wanted to accomplish. 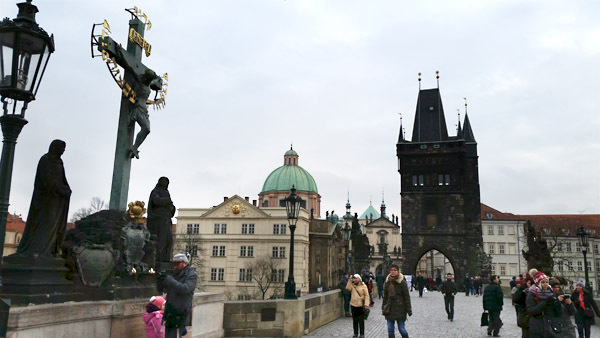 First of all, learn how I could use the tram system to get to the palace complex. It took a little effort but despite the language barrier I soon learned what trams I needed to get there. 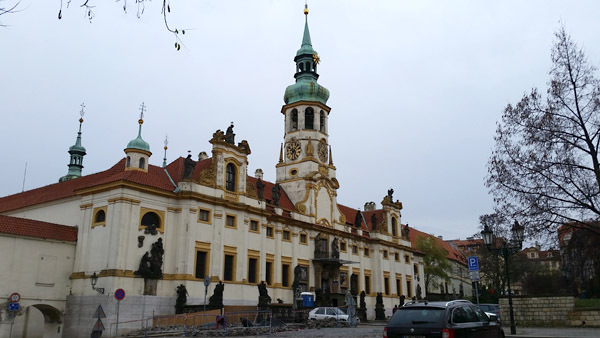 I took Tram 17 up the river towards old town then changed to 22 which let me off in front of the church of Our Lady of Victory built in 1611 that houses the Infant of Prague. 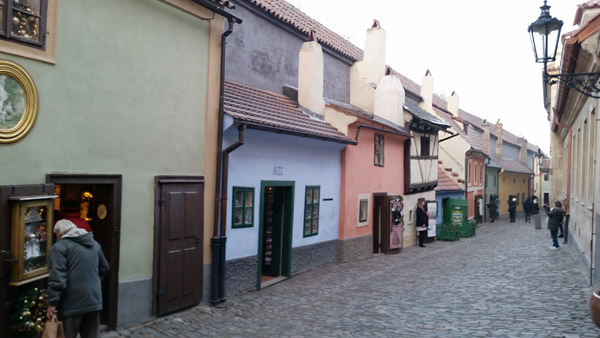 It lies within one of the oldest quarters in the city. 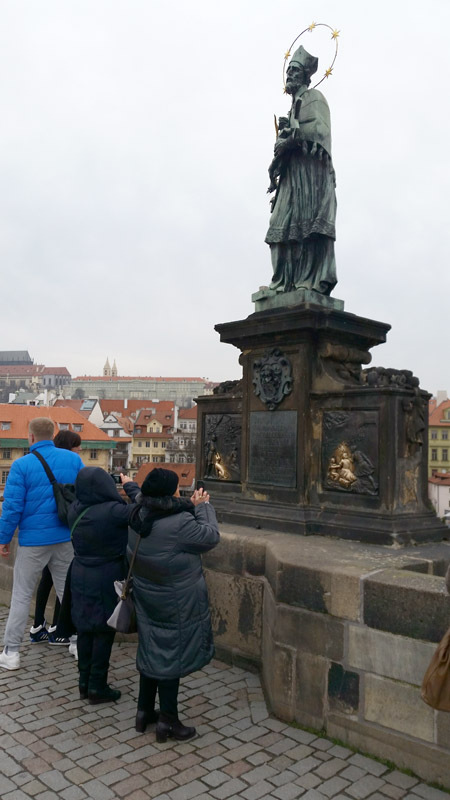 The statue was given in 1628 to the Carmelites by Polyxena Lobkowicz who received it from her Spanish mother, Duchess Manrique de Lara. (Please click the pictures to see larger versions). 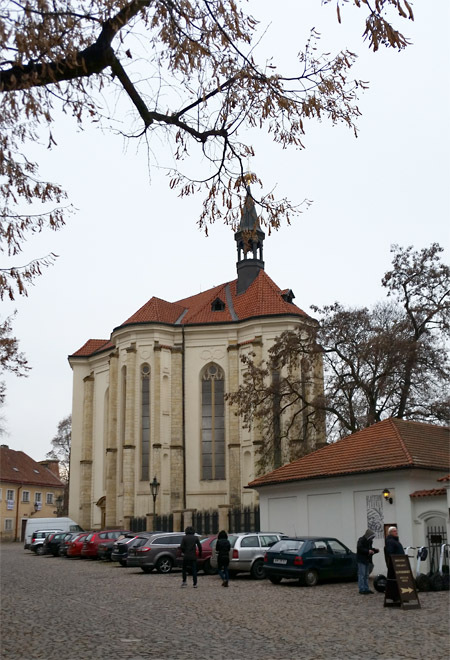 Church of Saint John Nepomuk, National saint of the Czech Republic who was drowned in the river Vltava in 1393 by King Wenceslaus because he would not divulge the secrets of the confessional. 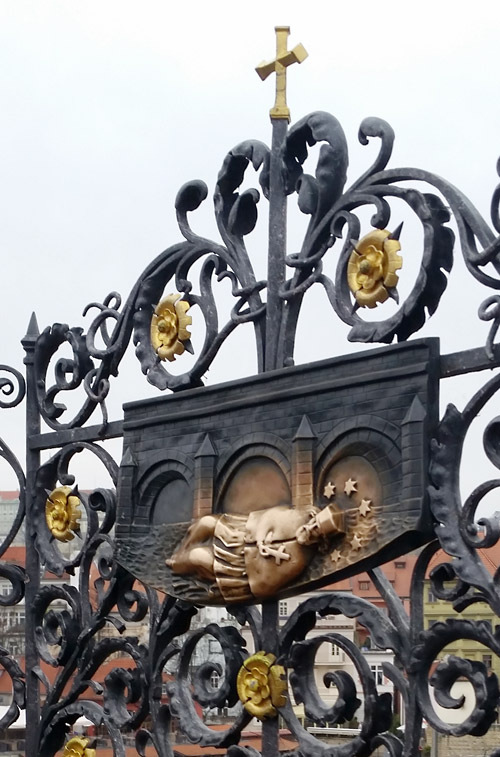 These are along the Golden Mile. 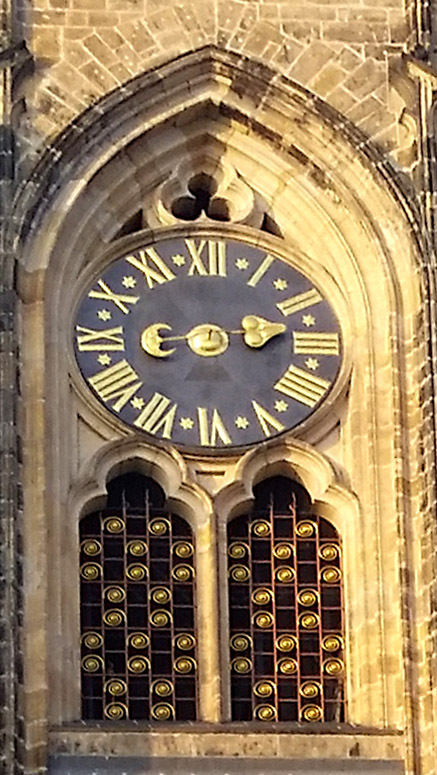 Above is House 22. 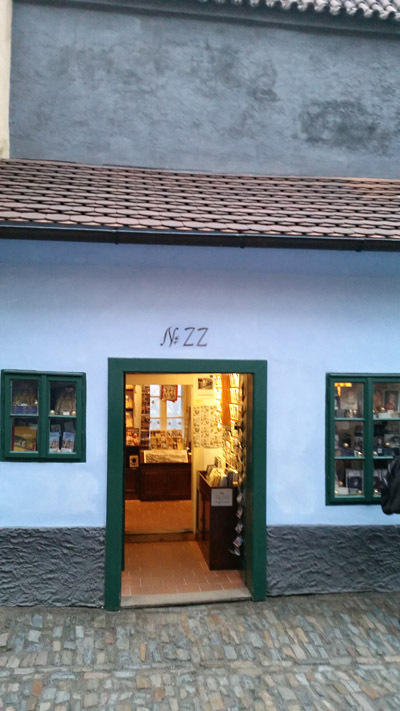 Franz Kafka lived in house 22 on Golden Lane from 1916 to 1917. 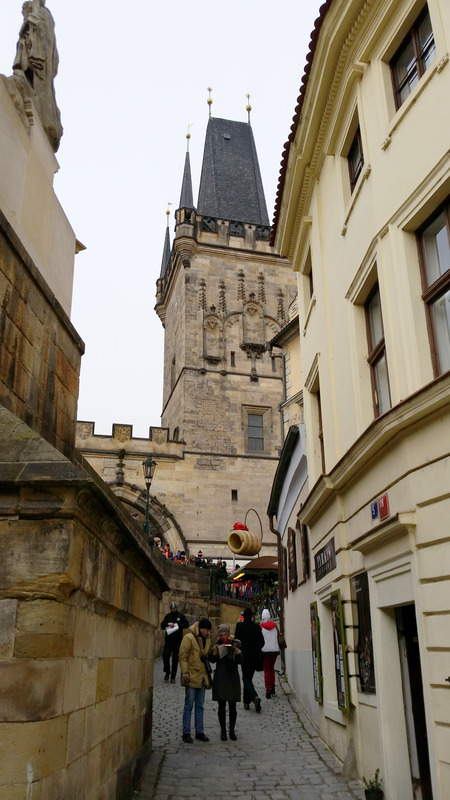 I continued with Tram 22 up the steep climb to get to the palace complex. 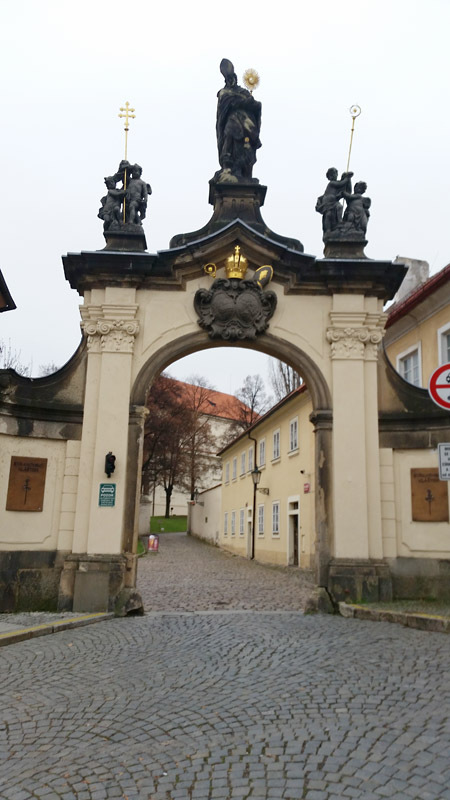 I wanted to see where the Defenetration of Prague took place in the royal castle in 1618. Defenetration is when you push someone out of the window to their death. Several Protestants threw two Catholic regents and their secretary out the window and they fell 70 feet but did not die. Catholics claimed a miracle but the Protestants asserted the men fell into dung. That story was unknown to their contemporaries. 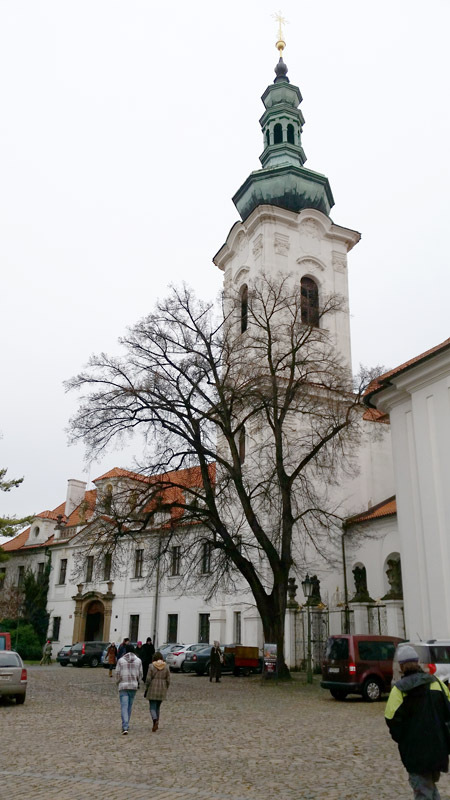 One man fled, and the two others took refuge in the Lobkowicz palace. This event triggered the 30 years war. 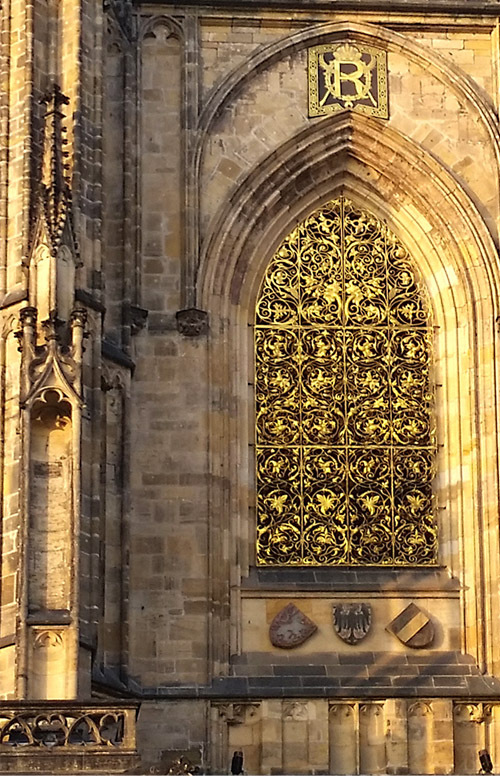 Window where the Defenestration of Prague took place. 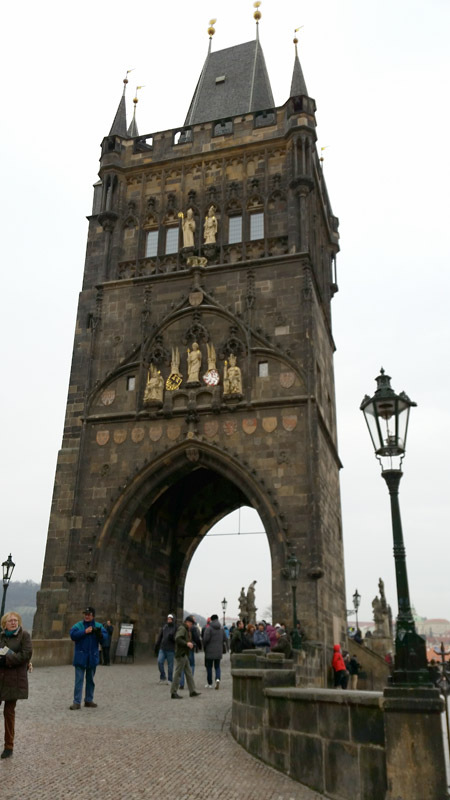 I also wanted to avail myself of what Prague offers in terms of concerts at a reasonable cost. 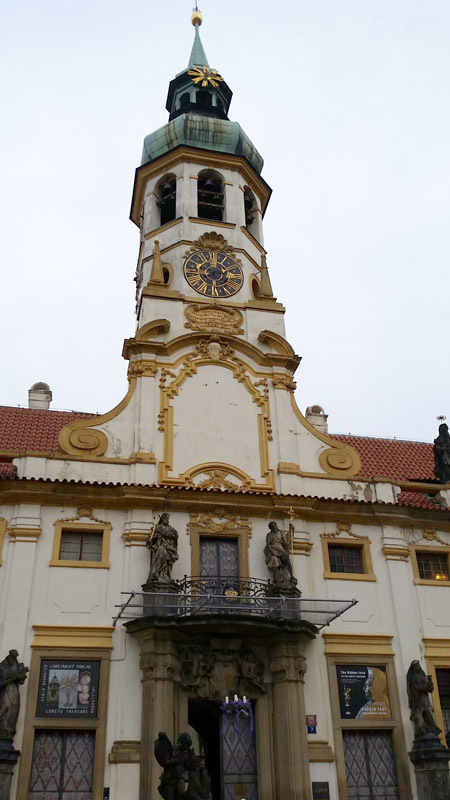 Therefore I toured the Lobkowicz Palace and remained for a midday concert. The property was lost twice to this family. 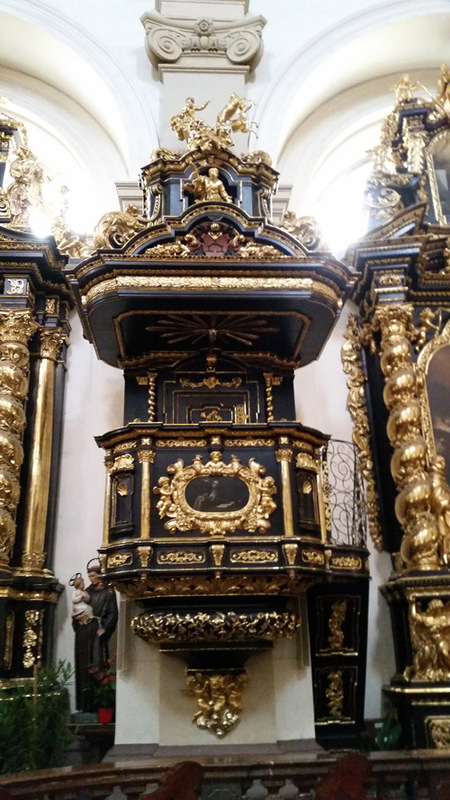 First the Nazis confiscated it and then after it was returned the Communists took it. After the Green Revolution it was restored. After the tour of the palace, there was a musical offering in the Palace’s decorated concert hall with impressive 17th century ceilings. 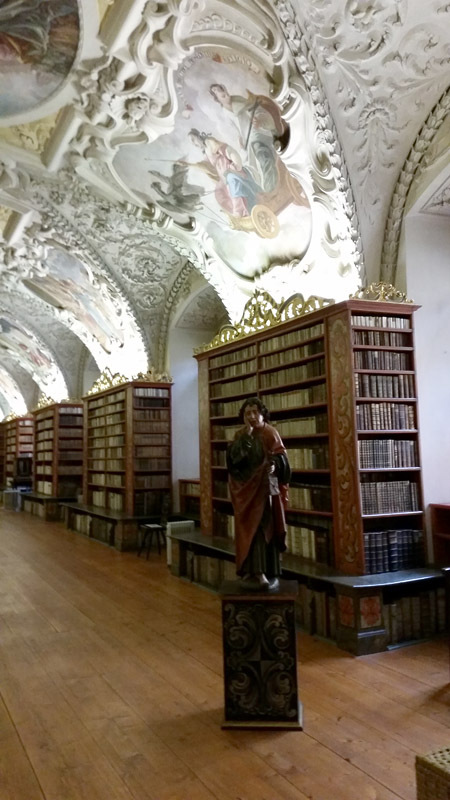 This art collection is impressive but even more intriguing is the history of this family that played an important role in Bohemia for centuries. 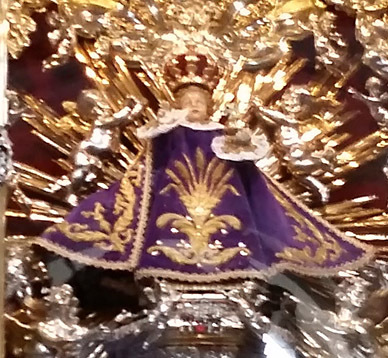 In fact, Polyxena who gifted the infant of Prague tot the Carmelites was a member of this family. 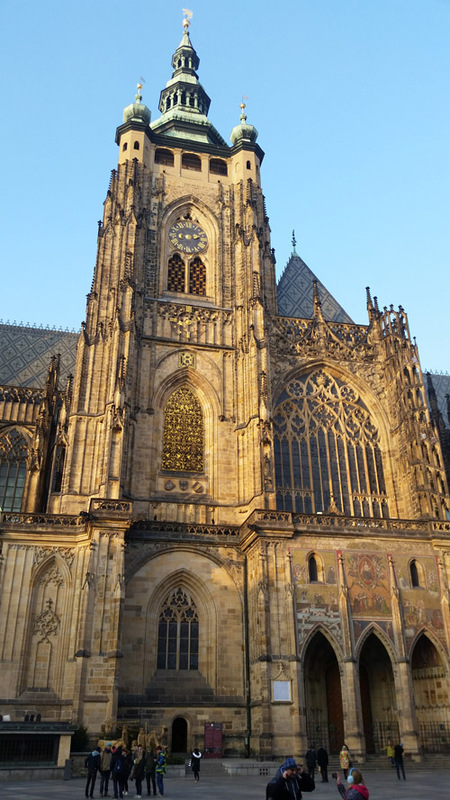 The cathedral of Saint Vitus is situated in palace complex and is an excellent example of Gothic architecture. 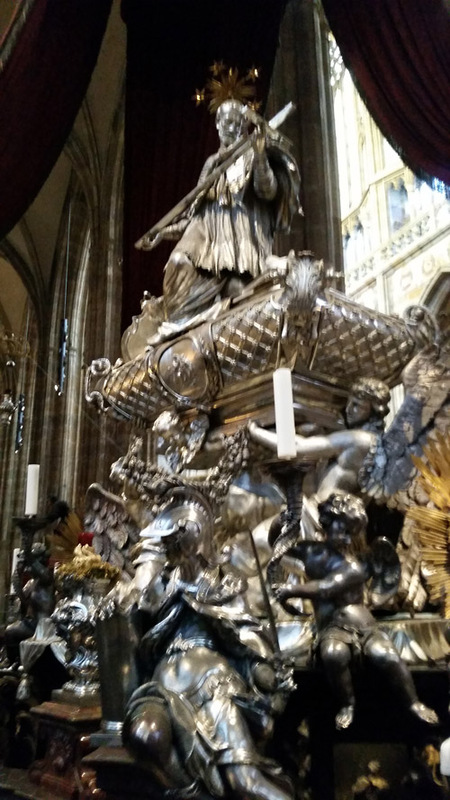 It houses many tombs of Bohemian kings and Holy Roman Emperors. 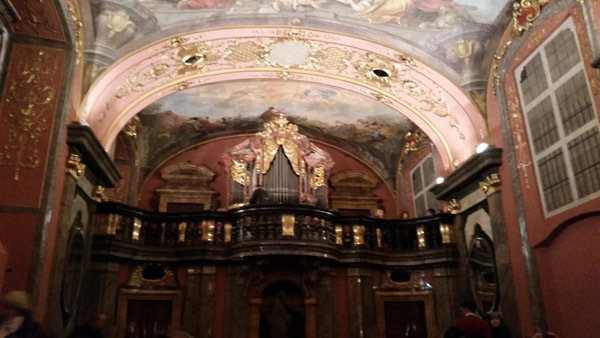 The afternoon concluded with another concert at Saint George church in the palace complex. 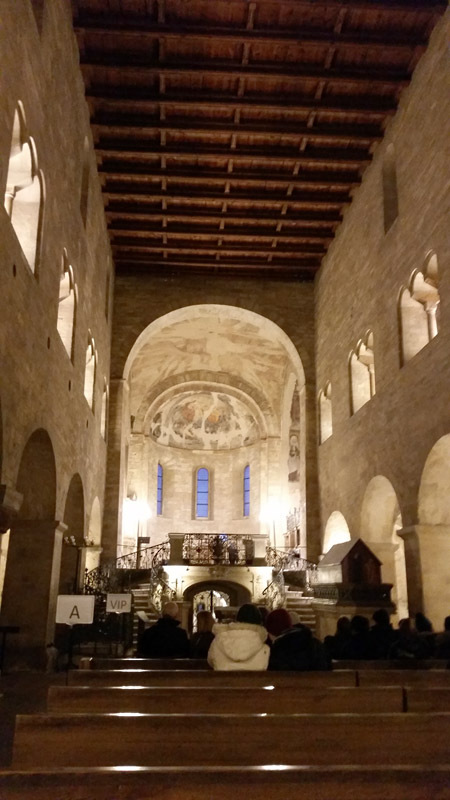 The Romanesque church was a beautiful setting for a concert on the Christmas concert of Corelli and Vivaldi’s Four seasons. 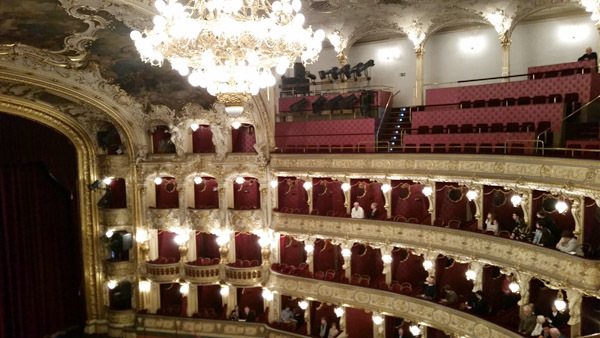 This evening I went to the Prague opera house for a production of The Barber of Seville. 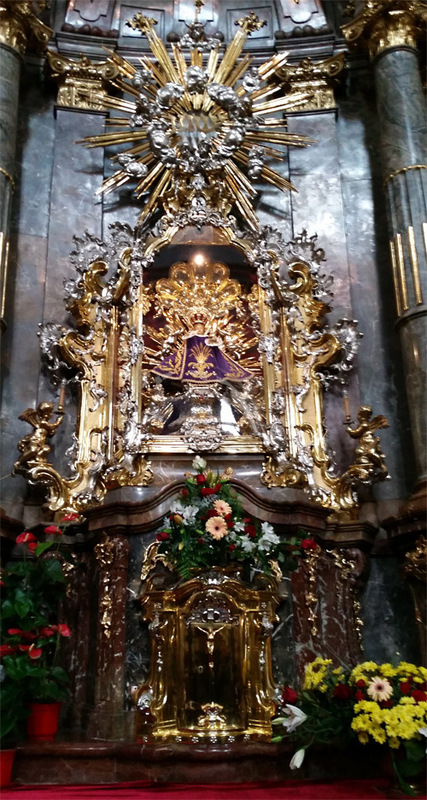 This entry was posted in Beauty, Europe and tagged Cathedrals, Golden Mile, Infant of Prague, Kafka, Prague, St. John Nepomuk, St. Vitus on December 12, 2014 by frjfkauffmann. 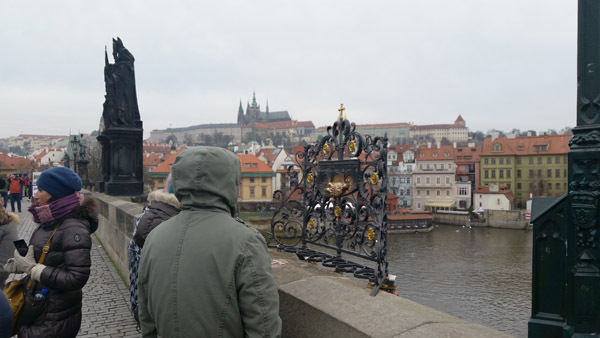 When we crossed over the border from Germany to the Czech Republic my mind was filled with the melody from Bedřich Smetana’s musical composition Vltava which is named after the river that flows through Prague. 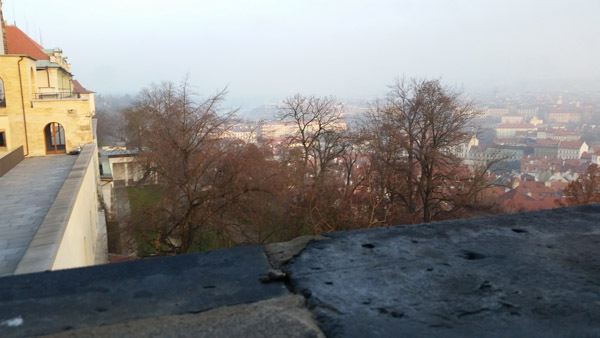 The melody has always attracted me and the melody continued to move through my mind as we approached Prague. 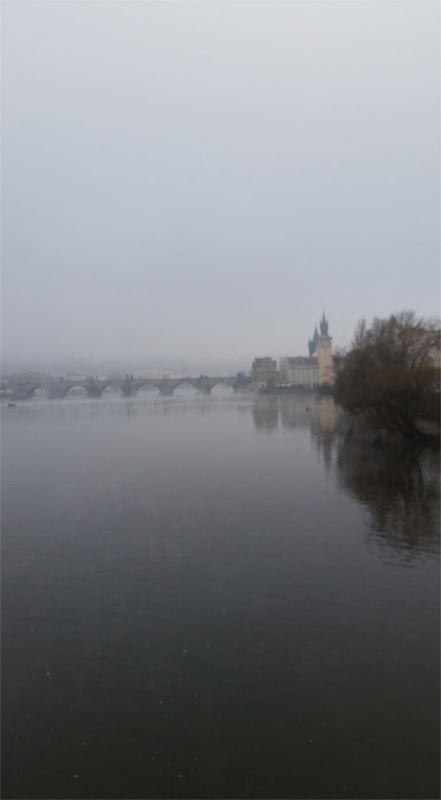 Soon I would see the river that inspired Smetana and I arrived with a hope that I would hear it in Prague. When I arrived I was not sure what to do since the language is so strange to my ears. I asked a young woman to help me and she got out her iPhone, got directions to the hotel then took me to the cash machine so I could buy a tram ticket. She then helped me purchase the ticket and stayed with me on the tram until I reached the hotel. 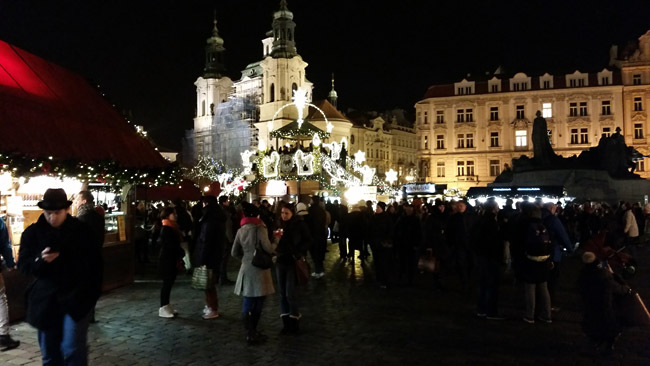 Everyone in Prague is so eager to help and if they cannot they will find someone to help. 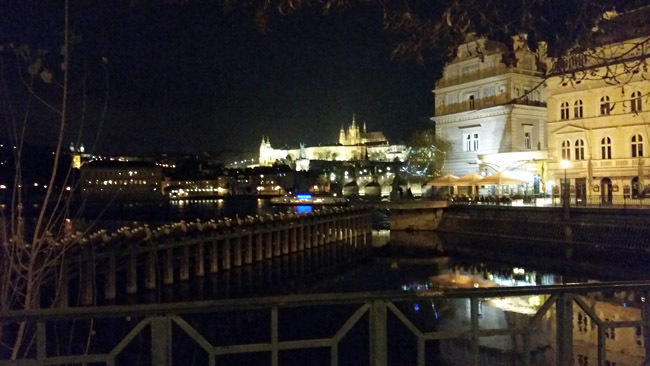 The hospitality of the Czech people is stunning. 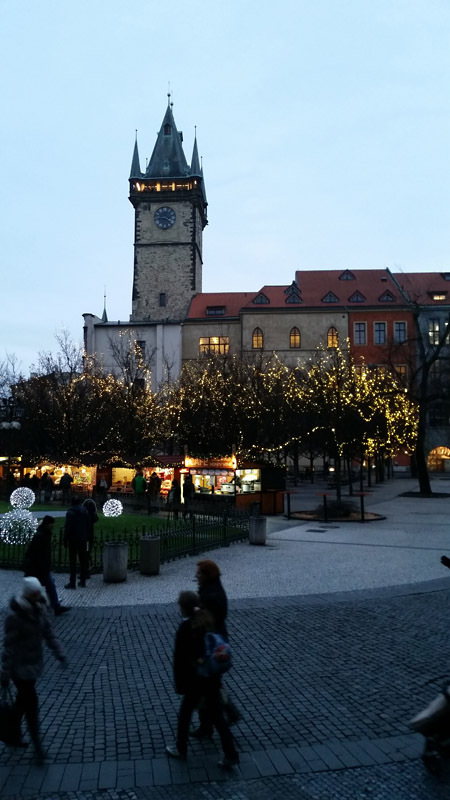 That evening I went to the old town which is magical since it is so decorated for Christmas with beautiful markets. 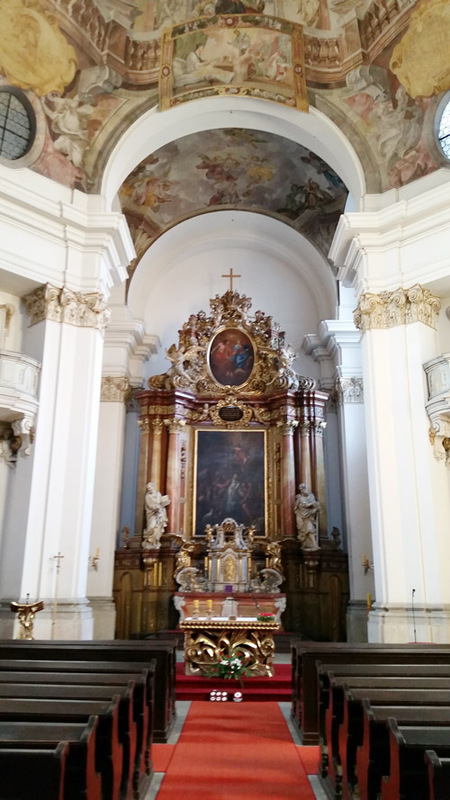 That evening I went to a concert performed in a Baroque Hall at Saint Michael Monastery. THere were great selections from Corelli’s Christmas Concerto and other offerings from Vivaldi, Handel and Mozart. 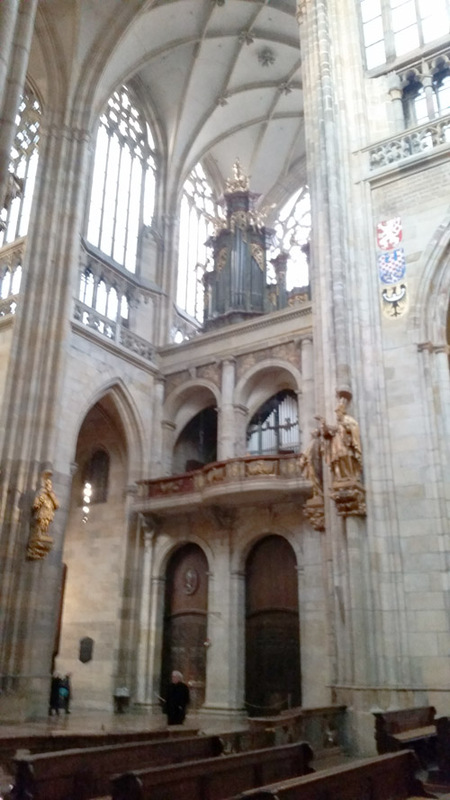 The concert set a wonderful tone for two days in Prague. 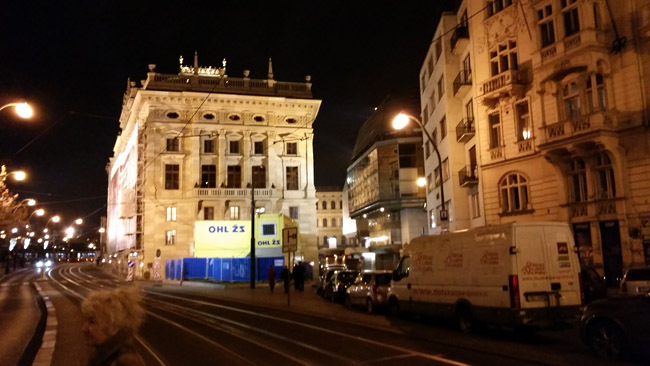 This entry was posted in Beauty, Europe and tagged Prague, tram, Vlatava on December 12, 2014 by frjfkauffmann. 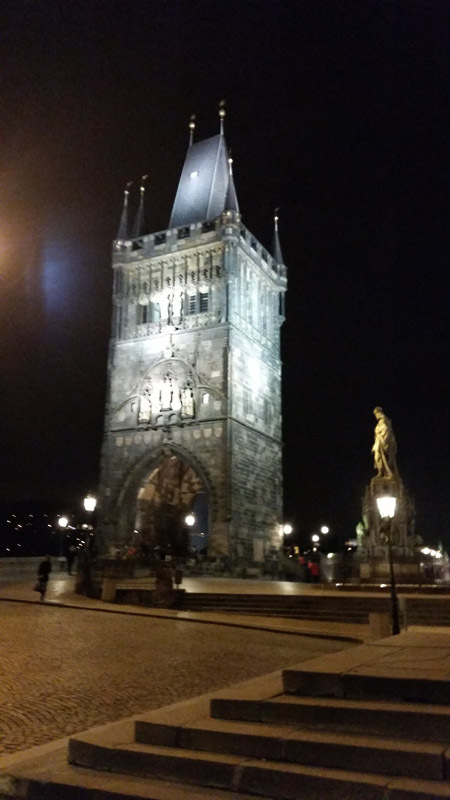 Prague is a magical city. Many more photos to come in the next few days. 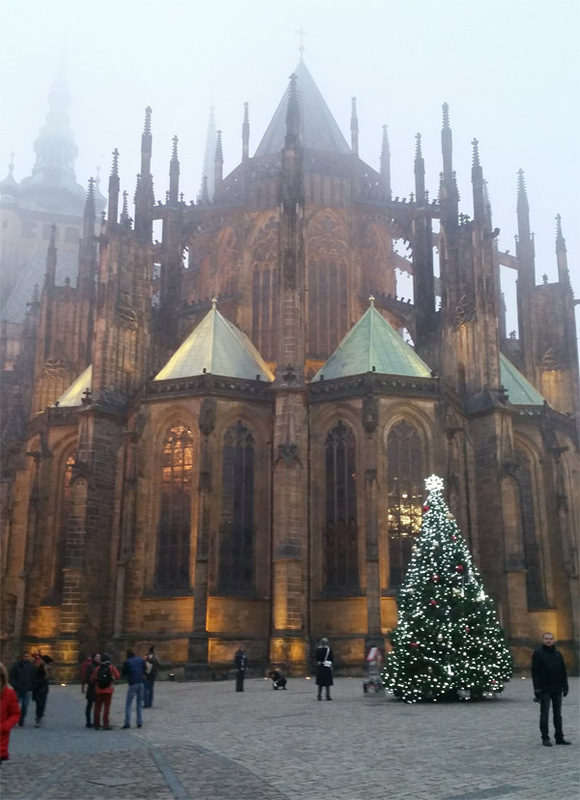 This entry was posted in Beauty, Europe and tagged Europe, fog, Prague on December 11, 2014 by frjfkauffmann.